Breath of the Beast: Nablus- Trashed or Staged? Second Draft is working on a big story involving a report filed by CNN's Ben Wedeman a few days ago. His report was on Israel's efforts to deprive Hamas of the wherewithal to continue their assault on the PA and expand their terror campaign to the West Bank. Wedeman's whole report (see it here) is disjointed and confused. There are good reasons why this veteran reporter has turned out such a shoddy report- more on that later- Second Draft's team is working on all aspects of this. I want to concentrate, for now, on a less spectacular aspect of this piece. This is the aftermath of an Israeli crackdown in the West Bank – on institutions Israel claims are linked to Hamas. They raided this office of the Palestinian Authority responsible, among other things, fo managing the Mosques of Nablus. Sounds innocent enough but Google that office up and you find that it is a key in the battle between Fatah and Hamas. Hassan Hilali who heads up the office and who Wedeman interviewed is major player in the effort by Fatah to deny Hamas access to the mosques- which, as we know, is how they recruit and organize. Its very cute of Wedeman to try to portray the office as a simple office that “manages” mosques” It makes it sound so harmless and religious. This mild statement is not in line with the usual over the top hysteria with which most Palestinian accusations against Israel are delivered nor does it seem to square with the disorder that is pictured- desks in disarray and the floor strewn with debris. A closer look at the footage makes me more suspicious. One shot is of a small room with two desks. 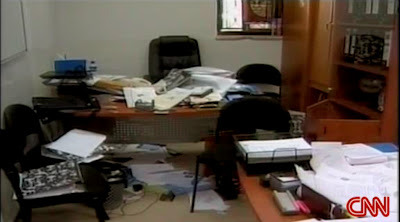 The two desks displayed about 14 seconds into the report appear to be undisturbed under a layer of loose stuff thrown on top of them. For instance, you can see in the photo below that there is an "in basket" in the corner of the desk in the right hand side of the frame and all the papers are still stacked "neat and tidy"- obviously either inspected carefully and put back in good order -or entirely untouched. 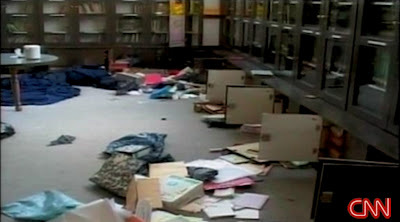 The loose-leaf binders and other debris thrown on top of the desks are not torn apart or even opened- as as might be expected in a search where so much material is thrown around. It is as if someone is tried to make it appear as though a ransacking had occurred without too seriously disturbing the next day’s work on those papers. Looking around that room a little more we see that only the very bottom doors of the wall cabinets are open. The upper doors and their contents seem to be undisturbed. We can see very clearly through the glass doors on one of the upper cabinets that the neatly stored books and papers on the shelves are still orderly and undisturbed. I don’t know about you but when I arrange my storage, the things that I use the most and are the most important are the ones up at eye-level not stuck away underneath in floor-level cabinets. If I were looking for something interesting/incriminating in someone’s office, I wouldn’t be looking exclusively down with the leftover stationary and ancient party decorations in the lower cabinets. The larger room shown at :20 of the report shows that same odd way of searching for incriminating evidence. Only the lower, less accessible cabinets in the room have been opened and rifled. The floor is littered with what look like large tablecloths, shopping bags and boxes that might be the contianers that calculators and software might have come in even while books and files which might have been holding a trove of information are still visible and neatly stored in the glass-front cabinets above. So, what is it? Trashed or Self-destructed?
" These are the same happy folks who brought us al Durah, Jenin, Kfar Qana and Gaza Beach..."